Buying an electric vehicle can help the world to avoid war. Well, Flip the Fleet didn’t expect that when they polled owners of electric vehicles this month on their reasons for buying an EV. But the respondent was adamant: “Oil played a huge part almost all wars since WW2. The Syrian war today is an oil war,” referring to the way both the West and Russia have an interest in oil pipelines going through Syria. This comment was one of many from owners who drive electric cars partly to escape the oil industry’s power, and its impact on our economy and environment. “EV owners tend to think globally and act locally,” says Ms Pam McKinlay, a spokesperson for Flip the Fleet, and EV owner. This month’s poll asked EV owners what their main reason for buying their cars: fast pick-up/acceleration; green credentials; low running costs; smart technology; quiet and comfortable ride; or for some other reason. The desire to promote world peace fell into the last option. Nearly half of the respondents, at 49%, had bought an EV for its green credentials. Many felt a personal and global responsibility to avoid greenhouse gases and climate change by taking the ‘car’ out of their ‘carbon footprint’. One named Donald Trump in providing a wake-up call that people can’t rely on politicians to protect the planet – so they figured they had to step up themselves. Many expressed a sense of urgency and figured that buying an EV was one of the most practical ways that families and businesses can act for our children’s future. Low running costs was the main attraction of EVs for 33% of respondents, mainly because of reduced fuel costs. Financially-savvy respondents saw that savings extend far beyond the petrol pump – for example, EVs are expected to last a lot longer and travel way further in their lifetime than equivalent internal combustion vehicles. The simple construction of electric motors also means they cost a lot less to maintain. The smart technology was the EV’s main pull for 7% of respondents, and 4% mainly wanted the quiet, comfortable ride. The latter included an elderly, hearing-impaired couple who now enjoy a nice chat while driving – and that may even ensure peace in their world, too. Lots of the owners found it hard to single out a main reason for buying because they love the whole package. 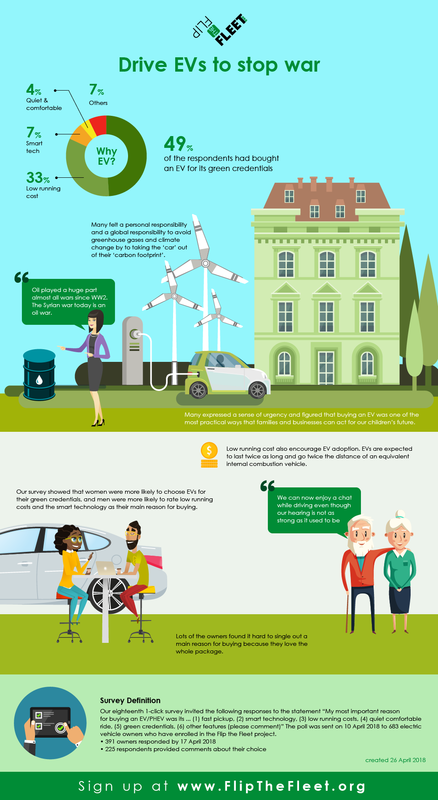 Flip the Fleet is a citizen science project that provides scientifically reliable information on the benefits and constraints of electric vehicles in New Zealand. The project is partly funded by the Government’s Low Emission Vehicles Contestable Fund, administered by the Energy Efficiency and Conservation Authority (EECA). Ms McKinlay is one of over 750 electric vehicle owners that have signed up to contribute monthly data from their electric vehicles to a communal database.